Akshardham Temple is a marvel of architecture that is unfolding the cultural legacy of 10,000 years. The construction of this grand structure took around 5 laborious years. Today, this imposing structure, standing on the banks of serene Yamuna River near Nizamuddin Bridge in Delhi, attracts millions of tourists and devotees to its doorstep. In Nov' 2005, Akshardham Mandir was inaugurated by Dr. Abdul Kalam, the honorable President and Mr. Manmohan Singh, the Prime Minister of India. The term 'Akshardham' is derived from two words 'Akshar' and 'Dham', where 'Akshar' means the eternal and 'dham' means 'abode'. 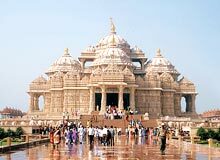 Consequently, Akshardham means the abode of the divine, the eternal. 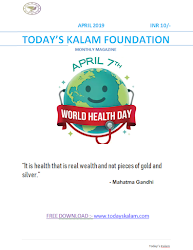 It is actually the abode of eternal values, principles and virtues that are mentioned in the scriptures (Vedas, Puranas) of the Hindu mythology. Within the temple, the 11 feet high gilded image of Bhagwan Swami Narayan appears mesmerizing to the beholder. The image is encircled by the preachers (gurus) of the cult. The meticulous flora, fauna, dancers, musicians and deities drape the complex of Akshardham Temple. The imposing structure was built with the blessings of Pramukh Swami Maharaj, the promoter of BAPS (Bochasanwasi Shri Akshar Purushottam Swaminarayan Sanstha). This NGO has built majestic and ostentatious temples worldwide, other being Akshardham Temple of Gujarat in India. Swaminarayan Akshardham Temple is the quintessence of the Indian rich legacy, traditions, ancient architecture and everlasting spiritual messages. The grand structure, lush gardens, exhibitions and various other attractions peep into the heritage of India in all its aspects and insights. The temple complex showcases the Indian heritage through various exhibitions like 'Sahajanand Pradarshan', 'Nilkanth Kalyan Yatra',' Sankruti Vihar', 'Yagnapurush Kund' , 'Bharat Upavan' and 'Yogi Hraday Kamal'. 'Sahajanand Pradarshan' (Hall of Values) is a hall that displays life-like robotics and dioramas. Through the medium of audio-animatronics, the events from Bhagwan Swaminarayan's life are portrayed. These events leave the message of peace, harmony, modesty, kind service and devotion to God. This hall embraces the world's smallest animatronic robot in the outlook of Ghanshyam Maharaj (the child figure of Bhagwan Swaminarayan). 'Nilkanth Kalyan Yatra' is another hall that comprises a giant screen film. This 85' x 65' screen is the first and only large screen of Delhi. The theatre portrays a movie, which is specially designed to show the epic pilgrimage made by an 11 year old child (Bhagwan Swaminarayan) across India. The third destination is 'Sanskruti Vihar', which involves a boat ride of 10 minutes. This enthralling ride is made through peacock shaped boats that make their way in a non-natural river. This river passes through the world's first university of Takshashila, chemistry laboratories, ancient hospitals, bazaars and Ajanta-Ellora caves. The ride concludes with a message for the future of the World. Yagnapurush Kund is the fourth destination embracing largest step well of India. This has a huge series of steps that take down to a traditional 'yagna kund'. In the daytime, these steps make a place to relax for the tired visitors, while in the night; these steps make the seats for the audience that come to watch the musical fountain show. Bharat Upavan encompasses lush manicured lawns with trees and shrubs. Sprawled in the area of sixty acres, the garden is adorned by the bronze statues of contributors to Indian culture, values and national pride. Yogi Hraday Kamal is a sunken garden that is wrought like a lotus. This magnificent garden features massive stones stamped with quotes from legends of the world. The variety of quotes ranges from Shakespeare, Martin Luther King to Swami Vivekananda and Bhagwan Swaminarayan. Swaminarayan Akshardham has been accredited for being the largest temple complex of India. It is amazing to know that this temple is built wholly in stone as per Sthaapatya Shastra, the architectural science of India. No iron or steel has been used in the construction of this temple. The beams, used for support are 22ft long single piece of stone. The intricately carved pillars appears, as if, whole poetry has been carved in stone. The temple extends to the height of 10 stories, where inch to inch of stone is delicately imprinted and what is more, the fascia appears remarkable. This colossal structure comprises 234 intricately carved pillars, 9 flamboyant domes, 20 quadrangled spires and magnificent a Gajendra Pith. It also boasts of 20,000 idols and statues that depict the great Indian souls in the form of sadhus, devotees, acharyas and divine celebrities. Elevated to the height of 141 feet, the tallest spire of the temple makes the house of the image of Lord Swaminarayan. An enormous amount of 2 million was spent for the erection of this majestic place of worship. The structure swallowed around 6000 tons of pink sand stone that was all brought from Rajasthan. This technique guarantees the fact that the shrine would last for a thousand years. The edifice took not less than 12 million man hours of 11,000 practiced craftsmen to carve every nook and corner. The splendid architecture of this temple provides glimpse of different architectural styles prevalent in India.